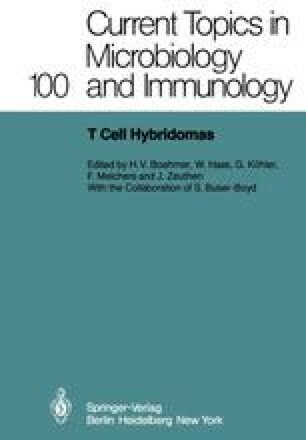 T cell hybrids are a potentially valuable source of antigen-specific helper and suppressor factors, molecules characterised by their ability to bind specifically to antigen, their lack of immunoglobulin (Ig) determinants, the presence of la specificities and the ability to mediate the biological effects of the T cells from which they originate (1–3, and this volume). In the first part of this paper we describe an approach to the structure of these molecules which we are applying to factors in supernatants both of T cells primed to antigen in vivo and of T cell hybrids. The method consists of binding the factors to antigen adsorbents and radioiodination in situ, followed by elution, characterisation by SDS-polyacrylamide gel electrophoresis (PAGE) and 2-dimensional thin-layer peptide mapping. The second part of this paper describes some of the biological effects of a specific suppressor factor produced by a T-hybrid line.